If you have any questions or want to enquire about dates, use our form to contact Vanessa Bennett-Dixon or see their website for more information. Stone cottages, nodding hollyhocks, ducks in the lane: Mareuil epitomises rural France, and the house sits in its heart. Arrive to a sweeping drive, an immaculate pool, a grand façade and Vanessa, who has travelled the world. After a final posting in Paris she landed in sunny Charente, and is very happy. Bedrooms are bright, airy and comfortable, with cosy bathrooms; dinners, in the ample dining room, are gastronomic, cosmopolitan, entertaining and preceded by pineau de Charente. You are surrounded by sunflowers and vines and Cognac is close. Friendly, interesting, great fun. Dinner with wine, from €32. We have been regular visitors to Le Bourg for several years, so much so that we can count ourselves friends of Vanessa (and formerly Vanessa and the inimitable Ron). Le Bourg has never failed to provide a delightful experience for us - spotless and comfortable accommodation, superb cuisine, and the main ingredient, a warm happy welcome and atmosphere. Can it get better than that? We had a fantastic stay and the food and hospitality was excellent. I would recommend staying hear to any of my friends. We have been staying at Le Bourg for the last eleven years and cannot recommend it too highly. The rooms are charming and superbly comfortable, the food is absolutely delicious and the welcome from Vanessa is warm and cheerful. There is a lovely pool for a refreshing swim before dinner and a beautiful garden to admire with a pre-dinner drink. It is a wonderful place to stay and we cannot imagine starting our holiday without a stay at Le Bourg. Visited again recently and, with rooms/beds as comfortable as this combined with the location, solitude, and superb fresh cuisine/wines - what more could you ask for?! Oh yes, musn't forget Vanessa's charm, and the excellent overall value. We have managed to stay at Le Bourg at least annually for the last decade. Whether as part of a French escape, or en route to/from a Spanish holiday, a few days here is an absolute must. It ticks all the boxes for superbly comfortable, peaceful and characterful accommodation, combined with the finest dining outside a rosetted restaurant, with wine to match, all at very realistic pricing, - topped off with Vanessa's inimitable hospitality! Like most recommendations we've had from Sawdays, Le Bourg earned 10 out of 10. A comfortable home with a welcoming hostess and fellow guests who shared travel tales but respected privacy allowed us to maximize the ecperience. Vanessa's meals were worth particular note and should not be missed. Impecable surroundings that earn repeat visits from travellers. In addition, the value was outstanding. Vanessa is a superb host - very welcoming and rooms are very comfortable with large beds and spacious en suites - her cooking is great and always fresh ingredients with local wines and cognacs - I doubt if anyone could fail to enjoy their stay. Beautiful house, wonderful host, comfortable spacious rooms and home cooked meals using fresh local produce and wines would love to stay again! Le Bourg is a wonderful place to stay and eat. The accommodation is spacious and well-equipped, the garden and pool are a delight. Even better, Vanessa and Ron are hosts 'par excellence' - they are so welcoming and friendly, and they serve up delicious food. Very highly recommended!! We stay with Vanessa and Ron every year on our way to join the family in a villa near Saintes. We cannot imagine going to France and not staying at le Bourg. The welcome is warm, the accommodation is splendid and the food delicious. Make sure you stay here with the perfect hosts. We wanted a short break and Le Bourg was just perfect. We went sight seeing to the towns along the Charente in the mornings and lazed by the lovely pool in the afternoons. Then it was time for an apero and a wonderful dinner cooked effortlessly by our delightful hosts, Vanessa and Ron. Most things are home made, including some wonderful smoked mackeral, and that applies to breakfast too. He house is lovely. Spacious, elegant but also comfortable. Just perfect. One of the most fantastically relaxing places we have stayed, wonderfully warm welcome, great bedroom and bathroom and the most WONDERFUL food!! We had planned to stay just a couple of days but we stayed longer - the dinner menu was just too hard to resist. Beautifully cooked and presented food, we have rarely eaten such lovely dishes cooked with such passion. Ron and Vanessa are naturally good hosts and not only enable you to feel welcome but let you have your own space too. We hope to return before too long - waist bands allowing!! A warm welcome from Ron & Vanessa whose hospitality was first class from the moment we arrived. The rooms were all very nicely appointed and the food was truly first class. We would recommend this place to anyone. On a trip down through France in convoy of open top cars we stayed at 7 places in 10 days - the welcome from Ron and Vanessa for a 4night stay was a welcome oasis of the "Craic" and food and drink - not always in that order!! Ron even cleared the barn to store the cars during an impending storm - We feel relaxed and at ease using "Le Bourg" and would rather it was kept secret from everyone else!! (Selfish I know)We will be returning again next year (if we are allowed ) and stay longer. Our stay at Le Bourg was a delight - what a wonderful find! Ron and Vanessa are superb hosts, and this, together with their delicious home-made meals, make Le Bourg an idyllic place to stay. A repeat visit is a must. Cognac Blues Passion Festival, 4 - 8 July 2019. Artists from all over the world converge on Cognac for this international event. Circuit des Remparts in Angoulême, 13 - 15 September 2019. Annual event for classic & vintage cars. Sunday, watch the cars racing around the streets of Angoulême, including 1920s and 1930s Bugattis. This is a must for fans of vintage cars. Tours of well known Cognac houses & not so famous local producers. And my personal recommendations for lunches include Le Château, Le Verre y Table, L'Essille, La Ribaudiere (one Michelin star), Graines et Garenne & Le Bistrot de Claude. 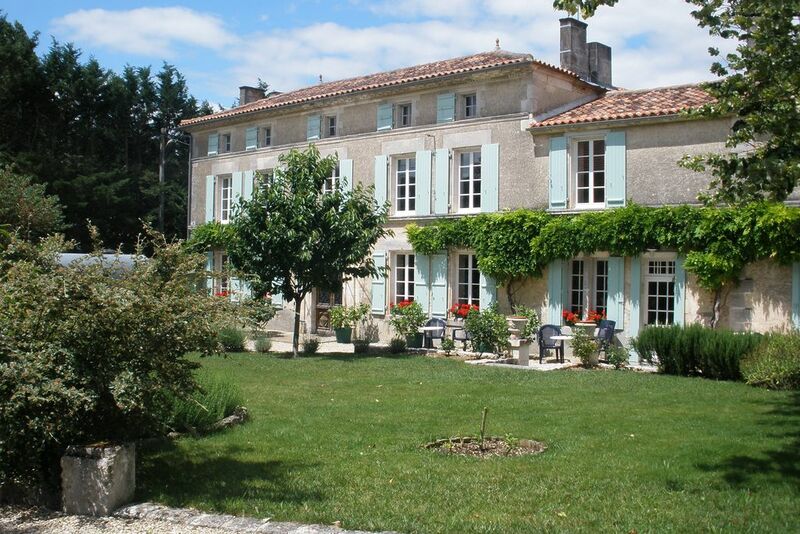 Nearby activities include golf at the 18 hole course at Cognac, canoeing in Jarnac, walking through the vineyards, cycling (bike hire can be arranged), numerous beaches (some for surfing) on the Atlantic coast, brocantes, boat trips on the river Charente. Salon de Goût at Segonzac, 1 - 3 February 2019. Top quality producers from all over France come to Segonzac for a truly gastromic weekend. A must for all you foodies out there. Easy day trips include: Saintes, St Jean d'Angely, Aulnay (UNESCO World Heritage site), Cognac, Aubterre-sur-Drome (underground church), Angouleme, Royan, La Rochelle & Pons. Further afield is Bordeaux & St Emillion.